Research aims: This study aims to examine the predictors of passengers’ behavioural intention in using railway services. It also attempts to identify whether these predictors differ among consumers of different age groups. Design/ Methodology/ Approach: A survey is conducted to collect data from the passengers using the KA Commuter Line (KRL) Jabodetabek. The 213 respondents are divided into two age segmentations comprising young and old. Data are analysed separately. The proposed model is tested quantitatively through multiple regression analysis and the independent sample t-test. Research findings: The results show that different age groups have different evaluations and they use different determinants for gauging the railway services. Perceived value emerges as an impor- tant determinant of customer satisfaction among the younger age group whereas service quality is the determinant for the older age group. Both groups, however, consider corporate image and customer satisfaction as determinants of behavioural intention. Theoretical contributions/ Originality: This paper contributes to existing research on public transportation from a marketing pers- pective. It extends on previous works by adopting age segmentation to examine passengers’ perception, evaluation and behavioural intention of using the railway services in Jakarta. Practitioner/ Policy implications: The findings of this study suggest that the Indonesian Railway Company should take age segmentation as a meaningful and useful social categorisation. It should not treat the entire population of passengers to be the same. Different age groups have different responsiveness and expectations of the railway services thus, the Indonesian Railway Company needs to put in more efforts in maintaining and improving its corporate image so as to encourage more people to use its services thereby reducing traffic congestion in Jakarta. Research limitation: This study is limited by its sample size. Therefore, it is not possible to perform structural equation modelling (SEM). Keywords: Behavioural Intention, Railway Services, Age Segmenta- tion, Customer Satisfaction, Corporate Image. ANSORY, Savira Miranti; ANYA SAFIRA, Anya Safira. 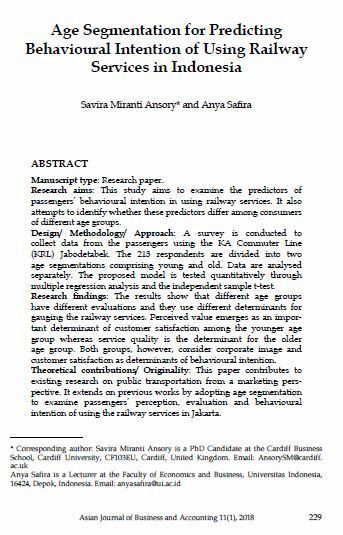 Age Segmentation for Predicting Behavioural Intention of Using Railway Services in Indonesia. AJBA, [S.l. ], v. 11, n. 1, p. 229 - 264, june 2018. ISSN 2180-3137. Available at: <https://ajba.um.edu.my/article/view/12153>. Date accessed: 25 apr. 2019. doi: https://doi.org/10.22452/ajba.vol11no1.8.